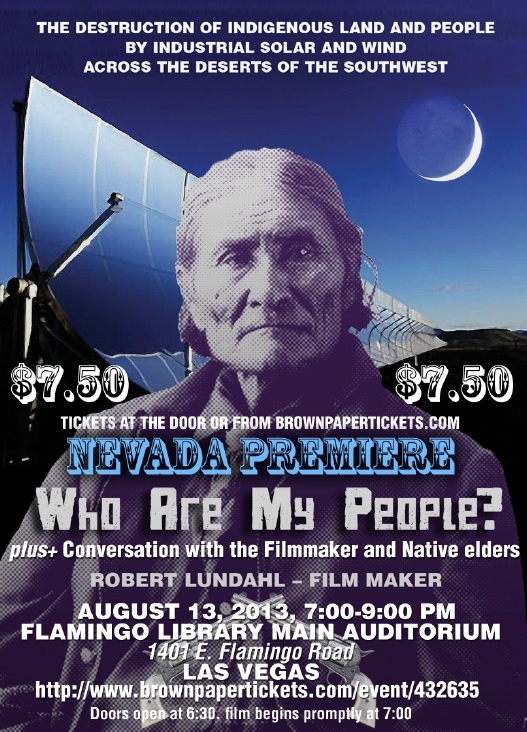 That is pretty much the theme of Robert Lundahl’s film “Who Are My People,” which will have its Nevada premiere Tuesday, the evening after Harry Reid puts on his perennial traveling planet salvation show, otherwise called the National Clean Energy Summit 6.0, which advocates building industrial-scale wind and solar projects on public land throughout the West. Unlike Reid, Lundahl, who grew up in the desert Southwest, sees something wrong with literally paving over hundreds of thousands of acres of pristine desert, which has been home to Native Americans and a wide variety of wildlife for thousands of years, with solar panels, solar mirrors and windmills, which in 25 years or so will be so much hazardous waste to be abandoned or hauled off, further scarring the landscape. The hour-long film is a pastiche of desert scenes and running commentary from archeologists and scientists to tribal leaders, who point to various sacred sites that could be destroyed by the industrial-scale “green energy” projects. Hatakulya, one of two mountain lions/persons who helped in the Creation. Sacred ceremonial dances were held in the area to honor the Creator of life. Only a month ago, BrightSource Energy killed its Rio Mesa project near Blythe after 740 fossils were found on the site. The project would have been similar to the company’s Ivanpah project, using mirrors to heat water in 750-foot-tall towers. But the Interior Department has already set aside 285,000 acres of Bureau of Land Management land in six states — including 60,395 acres in Nevada — where permitting for utility-scale solar projects will be streamlined. Perhaps railroaded is a better term. The Nevada land alone has the potential to generate 6,700 megawatts of power, in 2012 NV Energy’s peak generating capacity was only 6,000 megawatts. Lundahl has invited Harry Reid and a number of the attendees at his “green” confab to attend the screening. I doubt any of them would be willing to hear an alternative point of view. Lundahl invited Secretary of the Interior Sally Jewell, who is scheduled to be at Reid’s summit. Lundahl also points out in the film that huge amounts of taxpayer money is propping up these “green” projects in the form of grants and tax credits. The showing of “Who Are My People” is Aug. 13, 7 p.m., at the Flamingo Library Main Auditorium at 1401 E. Flamingo Road. Doors open at 6:30 p.m. Tickets at the door are $7.50 but can be purchased online. At last year’s “green” summit, Reid bragged that solar panels on Nellis Air Force Base save the Air Force $1 million per year. He neglected to say the panels cost $100 million and will last no more than 30 years. This entry was posted in Harry Reid, Las Vegas, Nevada, News, Newspapers and journalism, politics, Thomas Mitchell and tagged desert, green energy, Intaglios, Robert Lundahl, solar power, Who Are My People, wind power. ← When everyone knows the line is tapped, should we expect to really overhear real plots? These are things I have brought up in so many of those NSOE/NEITF “public” meetings. And I have to say that this film is the first movie I’ve wanted to go out to see in a long while. Green has nothing to do with protecting the environment. For how long did we hear about how sacred our “fragile desert ecosystem” is? I can’t go out and dig up a Joshua tree to plant in my yard. Yet huge swaths of vegetation (which is habitat to wildlife) can be mowed down, to put up solar panels. 450 foot tall wind turbines can be erected to knock birds out of the sky, and mar the beauty of our wide open spaces. I am from southern New Jersey, which has its own beauty, in a pre-revolutionary war town. There was history all around me, and Philadelphia with Independence Hall, Betsy Ross’s house, and so much more available to me. When I first moved to the desert southwest, I thought, “What an absolute wasteland.” But when I can take a drive, and see for miles and miles, I get the feeling I have all this space to myself. It’s an awesome sensation, and the beauty of the desert is striking. I love the part about not being allowed to dig up a Joshua tree. Someone tell this jerk there’s more than Joshua trees, there’s snakes, scorpions, turtles, rabbits, crows, spiders, coyotes, roaches, lizards and surely more. They should get the same respect the government and tree huggers have for the few dozen Dace squiggling in some little pond. Lemme see here. It’s objectionable to cover less than 1% of the desert with nonpolluting mirrors that will likely be removed someday, but it’s fine to lop off the top of a mountain permanently to get at the coal underneath – and then burn enough of it so all navigable rivers in Illinois have a mercury advisory on them. You don’t see the disconnecrt here? Besides, I would have thought that you would be overjoyed to have private enterprise utilize (they don’t buy it?) federal land. Myself, I like eyesores better than mercury, coal ash and slurry, mountaintop removal, and all the other problems that come with coal. Now cost, that’s another story. 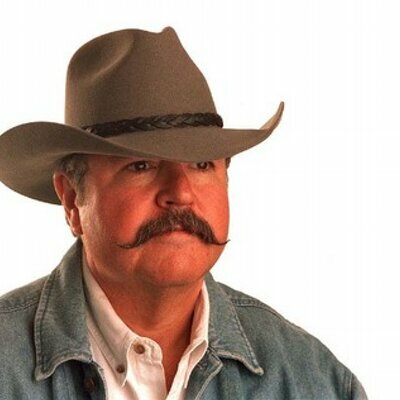 That’s my chief objection to solar. Taking up space? No big deal. It is a ridiculous thought for native americans to hold the entire southwest hostage. Should we have let them stop construction of the dams? They objected to those as well – and probably some Nevada cities too. Rincon: Does this mean that if the cost of solar is too high, that you’ll accept “mercury, coal ash and slurry, mountaintop removal, and all the other problems that come with coal”? If so, what cost of solar vs. cost of coal would be your tipping point? 150%? 200%? I never said those other things were OK, Rincon. I know I have brought up this topic before. The above gives you a multitude of choices. Where do you think wind turbines come from? How much mining and resulting toxins do you suppose exist in China, for the manufacture of wind turbines, along with the concomitant energy supplied by coal-fired power plants? And in China, we are not talking about clean coal. The pollutants put into the air by China simply cross the Pacific and come right here to the US. There is the cost and emissions from petroleum necessary to transport both “green energy” products, as well as the waste created by their manufacture to consider. People have been trained to believe that “green energy” is good for the planet, and the economy. They feel virtuous when they put solar panels on their houses (which their neighbors are forced to subsidize). In fact, they are ignorant of everything involved, including the necessity of building costly transmission lines to accommodate wind and solar farms. Simple stuff, Wendy. What’s missing is quantitation. I can easily say that the mining machines used to extract coal generate lots of toxics in their manufacture. Same with mining trucks, railroad cars and the power plants themselves. Did you know that the trucks contain some of the largest LEAD batteries made? When a mountaintop is removed, naturally occurring toxic chemicals are exposed to rainwater, causing the leaching of thousands of tons of toxic chemicals directly into the valley that was covered and into the streams that drain the area. Why, even the railroad ties are full of phenol, arsenic, or some other toxin. Since over 40% of the tonnage hauled by railroads is coal, this is significant. Detailing a variety of sources of toxics and energy usage does not a comparison make. Common sense suggests that it a panel that generates electricity for 20-30 years is unlikely to generate more pollution/toxics/energy wastage, etc. than burning our dirtiest fuel for the same 20-30 years and building the infrastructure to supply the fuel. The default in terms of pollution is solar. The opponents must prove that common sense is wrong for me to believe them. According to a 2011 U.S. Department of the Interior U.S. Geological Survey each Wind Turbine requires one acre of land to operate on which equal one million acres of land. “Achieving the goal of using wind energy as the source for 20 percent of the electricity-generating capacity of the United States by 2030 would require an average annual consumption of about 6.8 Mt of concrete, 1.5 Mt of steel, 310,000 t of cast iron, 40,000 t of copper, and 380 t of the rare-earth element neodymium.” What is not mentioned in the report is that the main source of rare earth for Wind Turbines is China. Rare Earth mining in China is the cause of great toxic waste that poisons China’s people and their land. This piece is very specific about what happens to solar panels and waste, and provides links to more data. “Nowhere is the waste issue more evident than in California, where landmark regulations approved in the 1970s require industrial plants like solar panel makers to report the amount of hazardous materials they produce, and where they send it. California leads the consumer solar market in the U.S. — which doubled overall both in 2010 and 2011. “The Associated Press compiled a list of 41 solar makers in the state, which included the top companies based on market data, and startups. In response to an AP records request, the California Department of Toxic Substances Control provided data that showed 17 of them reported waste, while the remaining did not. “The same level of federal data does not exist. “The state records show the 17 companies, which had 44 manufacturing facilities in California, produced 46.5 million pounds of sludge and contaminated water from 2007 through the first half of 2011. Roughly 97 percent of it was taken to hazardous waste facilities throughout the state, but more than 1.4 million pounds were transported to nine other states: Arkansas, Minnesota, Nebraska, Rhode Island, Nevada, Washington, Utah, New Mexico and Arizona. Your first reference is interesting, but I cannot find the makings of any crisis or problem. Perhaps a page number would help. Yes, a million acres is a lot of ground. Consider though that we use billions, not mere millions of acres for agriculture. Should we not grow so much food? As for “consumption” of concrete, steel, copper, and rare earths, all but the concrete would likely be recycled. And how much of these items are used by the coal and electric industries now? When it comes to toxic waste: Yep, it’s there, but where are the comparable figures for the coal industry? Something about coal ash disposal, slurry ponds, heavy metal leachate, and of course, air pollution come to mind. Coal is giving way to Natural Gas. The waste issue is getting harder to argue with each gas plant that replaces an old coal plant. Agreed Steve – and the cost of centralized solar is objectionable as well. Last night on Nevada Week in Review (on the local PBS station here KLVX CH10) Senator Reid was pressured on the costs of renewable energy. After first insisting Nevada has all the sun, wind and geo to be “energy independent” he was pressured into answering about the costs a second time. This time, after hesitating, he seemed to believe he hit on the answer. Smiling, he declared natural gas is the answer and costs would remain under control. No matter what one thinks about Sebelius, on this one he got it right. Later he asked Reid about the NSA program. Surprisingly he asked about the very issue Mitch brought up on this site, they know we are listening so why should we believe what they are saying? The inner TEA Sebelius tries to hide was bubbling to the surface, I think the building on Bonanza is infecting him. Also, in answering questions about DOE and nuke waste, Reid alluded to Yucca and it’s likely rise from the ashes of billions of burnt dollars. Hopefully Reid’s words come back to haunt him, continually and quickly.